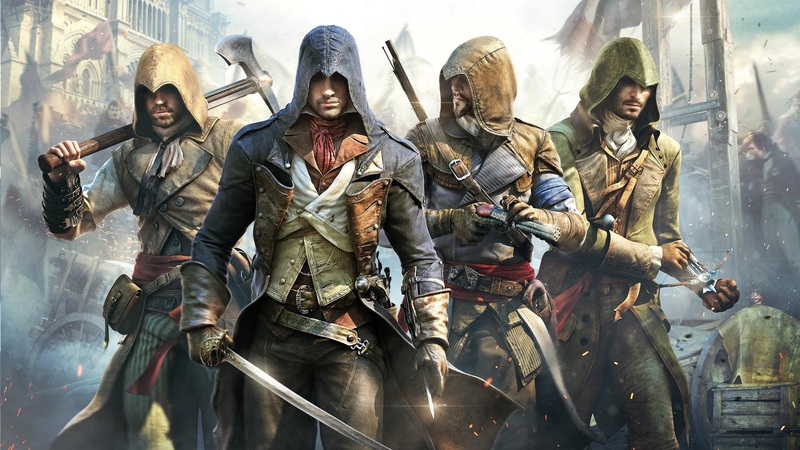 When the launch trailer for Assassin’s Creed Unity was released, I made the assumption that as the first Assassin’s Creed game in the current generation it will probably be the standard by which other entries in the series will be measured. It was a pretty trailer and it hinted at a pretty game, full of potential to be great. While it is true that we got a pretty game, we also got a somewhat buggy game that manages to combine both some of the best and the worst things in the Assassin’s Creed franchise. The French Revolution rages on as we go on a journey across Paris and meet new people, see exciting new places and then stab those new people visiting those new places. Onward! 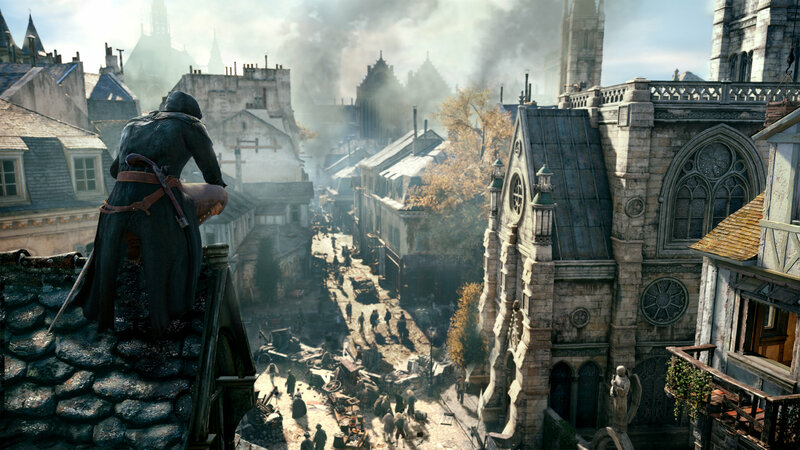 Assassin’s Creed Unity begins in what has probably become an iconic Assassin’s Creed start – when we first meet our protagonist, Arno, he’s a young whippersnapper full of promise and the playfulness of youth. In what is all sorts of layers of symbolism (especially for veterans of the series), you begin learning the basic mechanics of the game by stealing an apple. A few cutscenes and a bit of running around later, we fast-forward once more to Arno, now a young adult but still just as childish as he was a decade ago. Again, because this is Assassin’s Creed, we play through some more exposition and a pre-Assassin-protagonist sequence to move things along before the opening credits roll and the game begins in earnest. Throughout the beginning of the game you get small hints and glimpses of what’s to come – the French Revolution hasn’t yet gone critical but people are already amassing in the streets and there are riots and extremists all over. In fact, one of the things I loved the most was that if you stay in one spot long enough and just people-watch, you can see all sorts of things happening in small scripted events. You can see two people dragging a third off, or a fistfight over political opinion or a myriad of other small things that make the world feel alive and real. What’s more, the graphics of the crowds are generally quite good – there is enough variation in outfits and appearances to make crowds feel like crowds and not the same model copy-pasted twenty times. People also act different from one another – some will be waving flags, others burning effigies and yet others will just be loud and rowdy. Unfortunately, the graphics are also one of the game’s weakest points. Sure the game is gorgeous – when it works. I had the opportunity to play it on both the Xbox One and the PS4 and on both consoles there is a serious stuttering issue. Framerate drops to a crawl at unexpected moments and on one occasion on the Xbox One the game froze and the console had to be rebooted. There were several occasions of texture pop-up and some other quirks and bugs too numerous to mention. Not what I expected when I said that this will be the future standard of the franchise. When the game is playable, though, it is fun. Ubisoft has hired a Chief Parkour Officer to really nail the animations and traversal, and it shows. Arno’s movements are unlike any you have seen in the franchise to date. There is a fluidity and finesse to his moves now, something we have not seen in the previous titles. It makes free-running a great experience both visually and in terms of gameplay, as you now have the “Controlled Descent” mechanic which allows you to rapidly get down from any building or wall with the press of a button. Although sometimes the game doesn’t quite detect the path you want to take, it will usually get you down rapidly and effectively with minimal risk of sidewalk splatter – just as it should. You’ll still want to avoid using it if you need to stop at that specific window half-way down or have any degree of accuracy as to where you end up but it is a definite step up which makes you wonder how come it took so long to implement. Speaking of windows, they are a thing that exists now – and not just to decorate building sides. No longer are buildings just boxes you need to get over or around – sometimes you will want to get inside and not just for a mission. Paris is a home to everything from small workshops you can cut through, to lavish upper-class apartments with a doorman standing in front of a gilded door. This seemingly small addition adds another layer to the depth and size of Paris. Escaping guards becomes certainly easier when you can jump in through a ground-floor window, run up some stairs, and while the guards are looking for you inside, you quickly slip out the second-floor window and to the roof, off to your merry way. Escaping guards might sound strange to veterans of the series. While Assassin’s Creed is a franchise well-known for its stealth mechanics it is also well-known that when you’d rather just go on a killing spree, you can. Every protagonist is capable of a nigh-unstoppable whirlwind of death and facing off against large armies posed no challenge as you combo-killed your way through them. Not anymore. 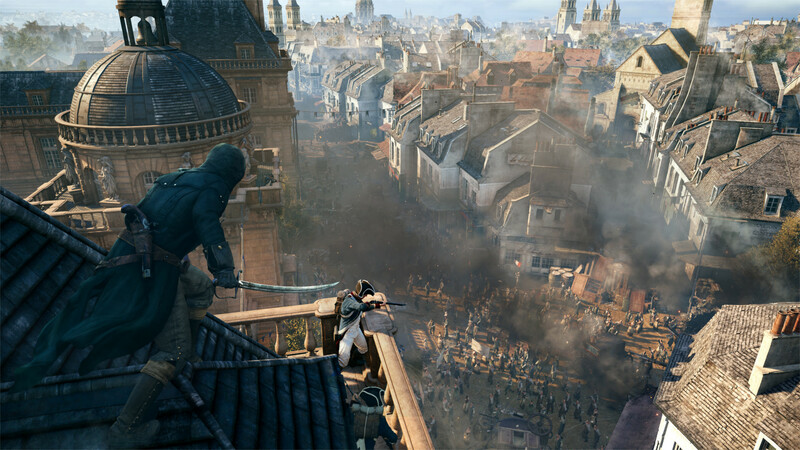 In Assassin’s Creed Unity, enemies are brutally tough and they even use some of the tricks you do. You can deal with a few, no doubt – maybe even as many as 3-4 at once or even more if your level and gear (as well as medicine and smoke-bomb supplies) are high enough. But in the end, they will win. To put some numbers behind this, I’ll just add the following: even with all the health upgrades purchased and a health-centric equipment setup, certain enemies can still blow through about half my health in a single shot. At the game’s start, I had the shock of being one-shot-killed by just a regular enemy. A humbling experience, if anything. Of course, the game balances this out by no longer having grandiose fight scenes – even when you have to deal with large amounts of enemies, they come in waves composed of just a few each with a short pause between them which practically screams “USE MEDICINE HERE”. The enemy types are also more varied with specific strengths and weaknesses just in case things weren’t hard enough. All of the above makes for combat that feels more challenging but certainly more rewarding. It also practically forces you to return to the “Creed” part of the title, as reminded to you quite early in the game: Hide in plain sight. Stealth is back with a vengeance and the farther into the game you get, the more critical it is for you to master the mechanics of cover, distraction, disguise and even plain old observation. Since rushing in headlong will no longer be an effective option, you’ll search for and disable alarm bells without even being told to and when you see a doorway guarded by 4-5 brutes and spearmen you will quite likely look for another way in. Of course, the element that binds it all together is the story – a violent backdrop starring the French Revolution and co-starring everyone’s favorite shaving razor, the Guillotine. Here, again, Unity takes a somewhat different approach from previous titles in the series with the complete separation of main storyline and side missions. This leads to memory sequences that have much less segments to them and less “clutter” but it also means that you are almost expected (at least at the beginning of the game) to seek out other side-missions on your own. Those side missions are crucial as they provide you the funds to purchase better equipment so that you may tackle greater challenges. Fear not, the side missions are anything but dull. In fact, I daresay I enjoyed them more than the main story – simply because of the different elements. You can solve riddles (related to Paris landmarks), work to solve murder mysteries or play cooperatively with friends to rob Templars blind. 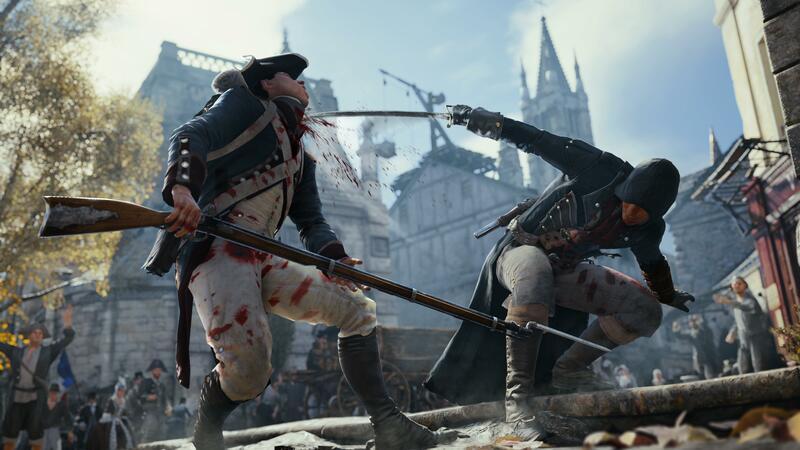 Yes, cooperatively – Assassin’s Creed Unity no longer has competitive multiplayer, for the better in my opinion. It never sat well with me and I’m glad for the switch. What more, the multiplayer element is well-executed and the missions are made to true Assassin’s Creed standards (although at launch the UPlay service was highly unstable, making multiplayer games a challenge). 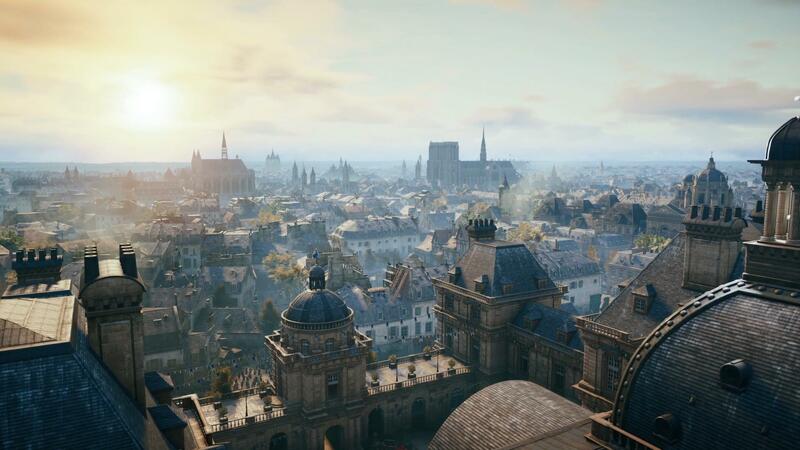 Assassin’s Creed Unity has the potential to be a great game and Paris is a perfect playground for it. Play the story alone or run missions with friends, take in a show at the Café-Théâtre or just do the randomly-occurring “Crowd Events” for additional rewards, and you will have tens of hours of content. Unfortunately there are some serious technical issues holding the game back from being all it can be, mostly framerate issues – but we can all hope it will be solved in a few more patch cycles. I, for one, hope for the best – after all, this is the standard for future Assassin’s Creed games to be measured against.